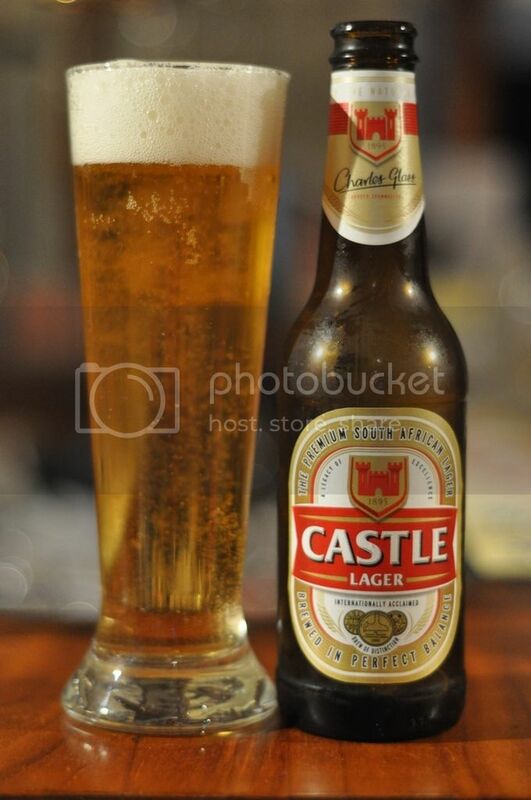 The national beer of South Africa is Castle Lager. When you think of beer drinking countries South Africa isn't high up on the list. The climate is hot though so you would imagine that this would be a nice refreshing lager. We can only hope so! What a fantastic pour, this beer looks sensational! The beer is a lovely golden colour with thousands of tiny bubbles rising to a dense 2 finger head of foam. These bubbles continue to rise throughout the duration of drinking this beer and makes sure a finger of head lasts right until the very end. There's a good ammount of lacing left as well. It's close to the perfect looking lager! South Africa's national beer tastes better than how it smells, but not a lot. There is maybe too much malt but the flavour is dominated by sweet adjuncts, like the corn syrup which was so evident on the nose. I can't discern any hops at all, and as such the beer really suffers from the lack of any real bitterness. The carbonation is fine though and the body is quite light, it would certainly be drinkable if it was ice cold and boiling hot outside but if it's not I'd steer well clear. It's a real shame that this beer can't deliver more than it does. The bottle looks great and the beer pours brilliantly and really builds up your hopes that this will be one of the better macro lagers. The excessive use of corn adjuncts has destroyed this beer for me. It would be wrong for me to recommend this beer, it's really not that good. If your in South Africa give it a try, but if your not you can find better beers.